An illustration of the concept of the Rossiter-McLaughlin effect. Each star generally rotates by itself and has an approaching part and a receding part. During a planetary transit, we can see the Rossiter-McLaughlin effect, which is an apparent anomaly of the stellar radial velocity, the star appears to be receding if the transiting planet hides an approaching part and vice versa. We can observe this effect by precise radial velocity measurements. Note that if the planet orbits in a prograde manner, the planet first hides an approaching side and subsequently hides a receding side. Inversely, if the planet orbits in a retrograde manner, the effect occurs in reverse. Astronomers have found that the extrasolar planet HAT-P-7b has a retrograde or highly tilted orbit. Studying such planets is important in understanding the diversity of planetary systems and assessing current models of how planets migrate. The findings could help astrobiologists in the search for habitable planets beyond our solar system. 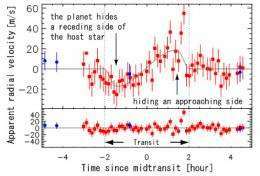 Two teams of astronomers have found that extrasolar planet HAT-P-7b, discovered in 2008, has a retrograde or highly tilted orbit. On May 30, 2009, a Japanese collaboration team led by Norio Narita (National Astronomical Observatory of Japan) used the Subaru Telescope’s High Dispersion Spectrograph (HDS) to observe the HAT-P-7 planetary system, which is about 1000 light-years distant from Earth, and found the first evidence of a retrograde orbit of the extrasolar planet HAT-P-7b. On July 1, 2009, a US collaboration team led by Joshua N. Winn (Massachusetts Institute of Technology) also used the Subaru Telescope’s HDS to independently observe the HAT-P-7 system and likewise concluded that extrasolar planet HAT-P-7b has a retrograde or polar orbit. Both observational results were independently submitted and accepted to scientific journals in August 2009, and were published in October 2009. At this time, HAT-P-7b is the first planet that indicates a retrograde orbit. Such retrograde or spin-orbit misaligned planets are important for understanding the diversity of planetary systems, and they provide important evidence for assessing current planetary migration models. It is now well known that extrasolar planets have diverse orbits, and recent planetary migration models have predicted the existence of such a retrograde extrasolar planet. The Subaru findings provide an important milestone for understanding the orbital evolution of planetary systems. Extrasolar planets are planets beyond our solar system. With the advent of large ground-based telescopes and innovative instruments to enhance the flexibility of observations since the 1990s, over 370 extrasolar planets have been discovered since the first one was identified in 1995. The discoveries have taught us that orbits of extrasolar planets are very different from those of the planets in the solar system. For instance, dozens of extrasolar Jovian planets orbit their host stars with a period of a few days (“hot Jupiters”), and many of the extrasolar planets have significant eccentricities (“eccentric planets”). In order to understand the diversity of planetary orbits, many theoretical models for planetary migration have been developed. The observational result of the Rossiter-McLaughlin effect on UT May 30, 2008 taken with the Subaru HDS (Narita et al. 2009). This figure shows that the HAT-P-7b first hides a receding part of the HAT-P-7 and subsequently hides an approaching side. The observational result of the Rossiter-McLaughlin effect on UT July 1, 2009 taken with the Subaru HDS (Winn et al. 2009). This result also indicates a retrograde orbit of HAT-P-7b as well as the previous figure. Widely held beliefs about planetary system formation have maintained that planetary systems form in rotating protoplanetary disks surrounding protostars. Thus the planetary orbital axis and the stellar spin axis are generally considered to be well aligned, as is true for the planets in the solar system. However, recent theories have not followed suit. For example, planetary migration models considering gravitational interactions between multiple giant planets (“planet-planet scattering models”) or considering Kozai cycles due to a distant companion star (“the Kozai migration”) predict that a significant fraction of migrated planets have tilted, or even retrograde orbits to the stellar spin axis. Retrograde orbits are those in which the planetary orbit is tilted by over 90 degrees to the stellar spin axis. A collaboration team led by Norio Narita at National Astronomical Observatory of Japan has used the Subaru Telescope to make observations that test such planetary migration models. The team focused on the Rossiter-McLaughlin effect, which is an apparent irregularity in the star’s radial velocity; the star appears to be receding if the transiting planet hides an approaching part and vice versa. By measuring the Rossiter-McLaughlin effect, one can estimate the sky-projected angle between the stellar spin axis and the planetary orbital axis. The Subaru telescope succeeded in detecting the effect in the TrES-1 transiting planetary system in 2007, and since then the Subaru Telescope has made observations of several transiting planetary systems. During the observation of the planetary system on UT May 30, 2008, the Japanese team found the first evidence of a retrograde orbit of the HAT-P-7b based on the Rossiter-McLaughlin effect. The result indicates that the planet first hides the receding part of the stellar surface and then the approaching part. The independent observations on UT July 1, 2009 of the US collaboration team led by Joshua N. Winn at MIT confirm these findings. At this point, however, the migration model for HAT-P-7b has not yet been firmly discriminated. Thus further observations of this system to search for outer massive planets or a binary companion would be interesting. In addition, since the HAT-P-7 system is within the field of view of the Kepler mission, further characterization for the retrograde planet HAT-P-7b will be studied in the near future. These studies were published in the Publications of Astronomical Society of Japan Letters (issue published on October 25, 2009) and the Astrophysical Journal Letters (issue published on October 1, 2009). 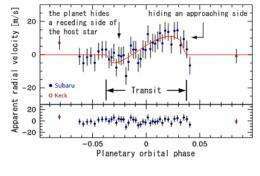 • Norio Narita, Bun'ei Sato, Teruyuki Hirano, Motohide Tamura, 2009 "First Evidence of a Retrograde Orbit of a Transiting Exoplanet HAT-P-7b" Publ. Astron. Soc. Japan, Vol. 61, No. 5, L35-L40. • Joshua N. Winn, John Asher Johnson, Simon Albrecht, Andrew W. Howard, Geoffrey W. Marcy, Ian J. Crossfield, Matthew J. Holman, 2009 "HAT-P-7: A Retrograde or Polar Orbit, and a Third Body" The Astrophysical Journal Letters, Volume 703, Issue 2, pp. L99-L103. Is The Solar System Unique in The Universe? Sure is a zoo out there ! !